Domino’s Pizza will pay Milwaukee $5,000 to fill potholes on city streets, but at least one alderman thinks it’s nothing but a publicity stunt. “That’s almost a joke,” said Alderman Robert Bauman after reading the title of the file at Wednesday’s meeting of the Public Works Committee. “Fine we’ll accept their $5,000,” said Bauman as he used his power as chair to close the discussion. The city will get to pick which potholes to fill, and isn’t required to fill them with Domino’s bountiful cheese. Yes, the pizza company is all about cheese these days. With advice and $12 million from the U.S. Department of Agriculture, it added 40 percent more cheese to its pizza in 2009, drastically increasing the fat content, while at the same time the U.S. Department of Agriculture ran an anti-obesity campaign. According to online reports, terms of the company’s proposal require the specific potholes to be covered with a stencil provided by Domino’s. The international pizza chain is providing 20 cities with $5,000 grants as part of its Paving for Pizza campaign. Department of Public Works spokesperson Sandra Rusch Walton tells Urban Milwaukee that the funds will go towards the purchase of 50 tons of asphalt. The exact number of potholes filled is highly variable depending on their size, but the asphalt should last approximately a half day. The grant covers the cost of materials, but not labor. The measure to accept the funds is sponsored by Ald. Cavalier Johnson. The grant’s acceptance will next go before the full Common Council. 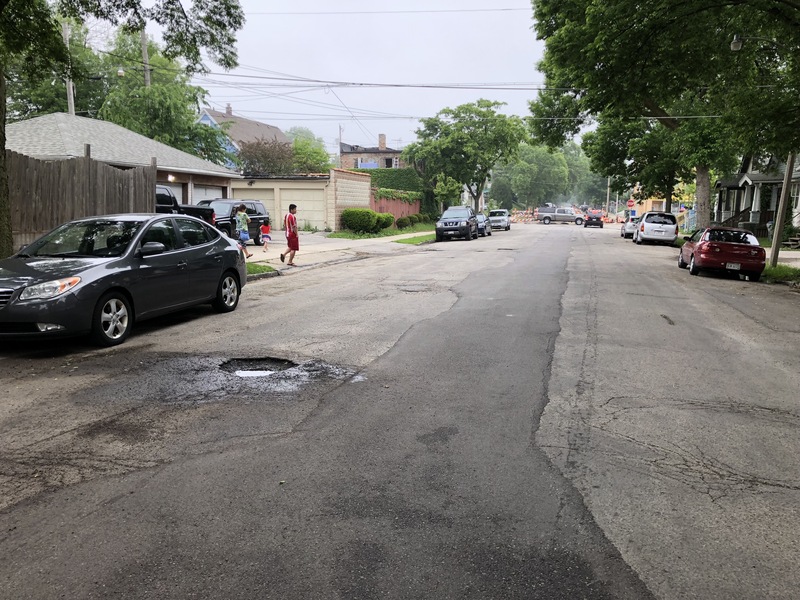 In other pothole news, a particularly large pothole I reported last Friday as part of an article on Milwaukee’s first protected bicycle lanes has been filled according to a city report. I haven’t been able to visually verify its filling yet, but appreciate that it was resolved within two business days — and without any subsidy from any pizza purveyor. Have a pothole that’s been bothering you? Report it using the city’s online service request system. Who knows, maybe it will end up with a Domino’s logo on it. Story updated at 4:50 p.m. to include comment from DPW. This could be a great opportunity for the city to highlight the delayed maintenance on the WisDOT controlled state routes in the city limits. State Route 32/S. 1st street and State Route 38/Chase Ave are absolute embarrassments, both in terms of their surface conditions and their designs within the context of their neighborhoods – death traps. Lisbon, Capitol, National, etc. These are several of the most important roads in our city, but their reconstruction is outside of local control. Of course, WisDOT would rather build 100 million dollar highway interchanges in corn fields and add unnecessary lanes to interstate highways, than perform any basic maintenance on their non-interstate system. Yeah, Domino’s is downright villainous for adding more cheese to their pizza 9 years ago. I still resent that. I know it’s pretty dystopic to have a corporation fill potholes with branded asphalt, but let’s be realistic here and take what we can get. The city/county/state/whatever has pretty consistently failed to develop and implement a solution to the deferred road maintenance in Milwaukee. Why complain about a no-strings-attached gift to that end? Well, I suppose you could count another passive ad as a string…. DISCLAIMER: I once got a coupon from a manager at at Domino’s, so I guess that makes me a paid corporate schill. The article says “the asphalt will should last approximately a half day.” I hope that was an error and that it’s the *decal* that will last half a day. Personally, I don’t care if it’s a publicity stunt or not. Corpropate sponsorships are all over the place (Miller Park, for example). I do think it’s pathetic that corporations have to fill in the gap like this, but let’s take it! @GreenDoor – Half a day before it’s installed in the ground. @dudemeister: It’s really the WisDOT roads that are in a state of comical disrepair. With few exceptions, they clearly need to be entirely reconstructed. i.e. No more patch jobs. They need to be crushed up, trucked away, and rebuilt – which is pretty expensive since these are wide, thick roads designed carry heavy volumes & industry, hence we have dedicated state gas tax that we all contribute to in order to fund this stuff, instead of out of local property tax revenues. The city controlled roads are generally serviceable – the high impact paving projects are keeping the more important thoroughfares working. Obviously, they could be better but in generally they are designed for low traffic volumes and neighborhood speeds, so a few ripples in the pavement isn’t a big deal. The county roads are probably the best of the 3, but there aren’t many of them in the city. They only really exist in outlying neighborhoods that the city annexed post-1930s, such as College Ave by the airport. Basically, if you want better roads in Milwaukee – which I think most of us do – we need to send our complaints to WisDOT and our state reps.